This picture really shows how dirty a commercial carpet can get. This Tampa FL Dr's office is usually cleaned every 6 months, but they fell behind on scheduling us to come out. Their carpet was looking rough but Chem-Dry of Tampa FL knows how to deal with tough commercial carpet cleanings. 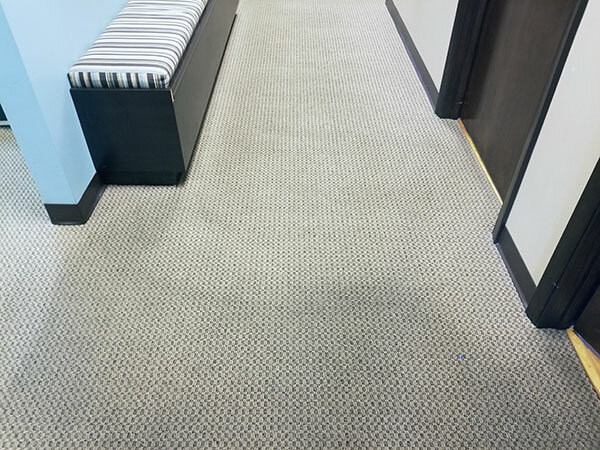 Our cleaning technicians use Chem-Dry's patented hot carbonated extraction cleaning process to remove the deep down soil in commercial glue down carpet. In picture above half of a hallway was cleaned. The bottom third was prepped and ready for cleaning. You can see the heavy soil build up on the carpet where patients come out of the examination room before moving to the front desk. This entryway has a lot sand ground into the carpet. In Tampa FL the primary soiling agent is fine sand particles that have been tracked in from the outside. Chem-Dry's hot carbonated extraction process removes even the smallest sand particles from glue down commercial carpet.